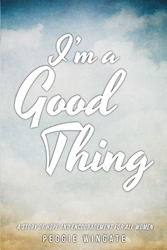 Peggie Wingate’s new book “I'm a Good Thing” is a tale that reflects the lives of biblical women that exude with faithful countenance. Recent release “I'm a Good Thing: A Story of Hope and Encouragement for All Women” from Page Publishing author Peggie Wingate is a wonderfully written opus that shares the wisdom of the Bible’s exemplary women through a woman’s life experiences. Peggie Wingate, a dedicated writer and devout believer of God, has completed her new book “I'm a Good Thing: A Story of Hope and Encouragement for All Women”: a heartwarming read that tells of a woman’s journey of learning the importance of faith by incorporating the lives of real women in the Bible. Published by New York City-based Page Publishing, Peggie Wingate’s enthralling narrative truly treasures evoking virtues that inspire readers of living a life of constant faith and spirituality. Readers who wish to experience this inspiring work can purchase “I'm a Good Thing: A Story of Hope and Encouragement for All Women” at bookstores everywhere, or online at the Apple iTunes store, Amazon, Google Play, or Barnes and Noble.